Conlan retired to Arizona, where he enjoyed playing golf. Upon Conlan's retirement, NL president Warren Giles said, "I know of no one who has been more dedicated to his profession, more loyal to the game in which he has been such a big party, and I hate to see him hang up his spikes." 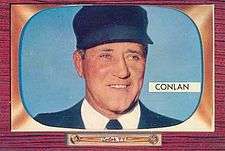 Conlan was elected to the Baseball Hall of Fame by the Committee on Baseball Veterans in 1974. He was the fourth umpire chosen, and the first NL umpire since Bill Klem in 1953. ↑ Conlan, Jocko and Robert Creamer (1997). Jocko. University of Nebraska Press. p. 26. ISBN 0803263813. ↑ "Jocko Conlan Stats". Baseball Almanac. Retrieved August 14, 2013. 1 2 3 "Hall of Fame ump Jocko Conlan dies". Ellensburg Daily Record. April 17, 1989. Retrieved November 22, 2014. ↑ "Jocko Conlan Minor League Statistics & History". Baseball-Reference.com. Retrieved November 22, 2014. 1 2 "Retrosheet:Jocko Conlan". Retrieved 2007-07-11. ↑ "Casey Stengel, Pagliacci of Baseball, also proves he is a sound manager". Milwaukee Journal. September 18, 1949. Retrieved November 22, 2014. ↑ Biederman, Lester (April 17, 1961). "Durocher, Conlan Get Their Kicks in Coliseum Battle". Pittsburgh Press. Retrieved August 14, 2013. 1 2 3 "Conlan, Jocko". Baseball Hall of Fame. Retrieved August 14, 2013.